West Worcestershire MP Harriett Baldwin today met with the Schools Minister to discuss issues about Worcestershire schools and in particular the challenges of operating in rural areas. 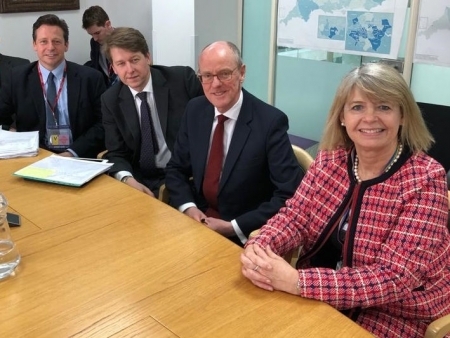 The MP met with a delegation of local head teachers last month and pledged to write both to the Department for Education and the Chancellor raising their concerns and this week, Harriett met with the Schools Standards Minister, Nick Gibb. Although Worcestershire schools have benefitted from the largest ever funding settlement getting £323.3 million for the next academic year, schools have faced extra costs including national insurance payments for teachers’ pensions. Last week, Nick Gibb wrote to Harriett confirming that school funding has risen for the three schools who met with her - per pupils funding is rising by 3.5 per cent at The Chase, 5.7 per cent at Hanley Castle High School and 4.7 per cent at Dyson Perrins Academy. Harriett commented: “I have had some detailed discussions with head teachers about cost pressures and passed on their concerns to my colleagues in Whitehall. “I have always supported the national efforts to deliver a fairer funding formula for Worcestershire schools and I will continue to press for the best budget deal whenever I can. “I welcome the clarity on local funding increases as there have been some false and misleading figures circulating from a campaign group that has been criticised by the UK Statistics Authority. Photo: Nigel Huddleston MP, Robin Walker MP, Nick Gibb MP and Harriett Baldwin MP.